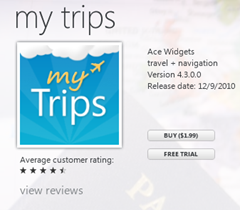 As you may, or may not, know I build a fairly well used TripIt.com Windows Phone application called My Trips. It all started as a side project when I switched from an iPhone to Windows Phone & there wasn’t a tripit app out at the time. Twitter comments & replies to people moaning about the official TripIt.com app on Windows Phone. Automated feedback if something bad happens in the app. The third one is really what I think has made ALL the difference in My Trips. Here is what I mean by “Automated Feedback”. If something bad happens in My Trips and my code doesn’t cope with it (poor coding on my part) then I catch the Exception in the Unhandled Exception handler and do something with it. 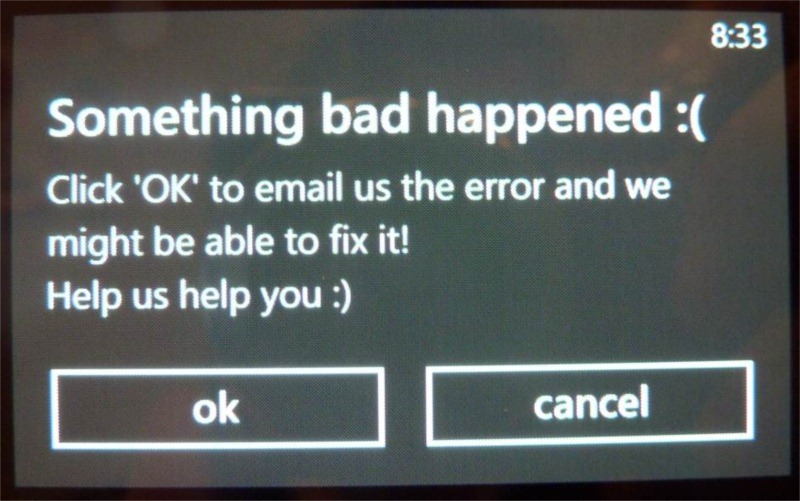 If they click “OK” then it creates an email with things like a stack trace, and other environmental information in it. All they have to do it click send. Most of the time a user clicks “OK” and sends me a bug report (not often any more … but in the beginning I got quite a few). Firstly, they don’t go running to the Marketplace and leave a bad review because they have already sent feedback (to me). Secondly, I take the bug reports REALLY seriously and I try to fix them ASAP. I reply and tell them I am looking into it & once I have found and fixed it I reply and say “Thanks again for reporting the issue” and that it will be fixed in the next update. They feel good because the problem is fixed and that someone listened to them. So what the real moral of the story here? … actively engage your users. Especially if something bad happens to their experience in your application. Its easy to do and I would urge everyone who writes apps to do something like this. 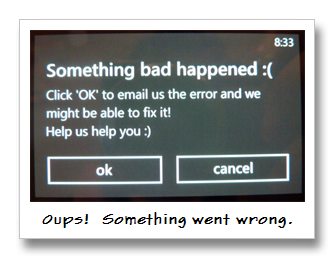 @toddbaginski also put me onto another service called bugsense that helps you record issues and errors in much the same way. They have a Windows Phone plugin too! This entry was posted in Development, Windows Phone and tagged Development, Windows Phone on January 7, 2012 by Chris Johnson.